Tribal and rootsy - gorgeous harmonies and infectious log drum rythyms, a refreshing antidote to much of todays self-obsessed pop. Te Vaka will appeal to world music fanatics,new-agers, smooth-jazz listeners and more. 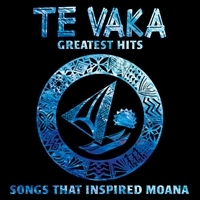 This album contains a collection of Te Vaka's most popular all time tracks along plus some particular favourites of John Lasseter (Creative head of Disney and Pixar) and a brand new single - "Lakalaka"
If you are new to the Te Vaka sound, this is album is a great introduction.